Please join us February 14 through February 16th for 25% off all furniture in our Thrift Shop! Be sure to stay tuned for the roll-out of our new Green Bag Special! This opportunity will start on the 21st of January and run through the end of year. With this special, you can make a donation of $15 to help and heal those in our community and you will receive a special green bag that gets you 15% off all your purchase at our Thrift Shop through the end of 2019. Please note this discount will not stack with special store discounts. Mark your calendars to ensure you get your 15% for $15 as supplies will be limited! Please note that the Thrift Shop and donation drop-off area will be closed for the holidays from December 22nd through the 26th, reopening on December 27th at 9:00am. We will also be closed December 31st and January 1st in observance of the New Year. Masquerade – 5th Annual Fundraiser Success! Thank you to everyone who came out and supported our local community at our 5th annual fundraiser! With your support we were able to raise $22,000 to help and heal those in our community. Support Interfaith Ministries When You Shop On Amazon.com!!! Good Samaritan Clinic Paid Off!!! Thank you to everyone who helped support our fundraiser to pay off our community’s Good Samaritan Clinic. Your efforts have resulted in the clinic being officially paid off! Your help will touch the lives of hundreds of local patients in need and ensure that we can continue to grow and help many more! We are having our fifth annual fall fundraiser coming up October 27th! We will be having dinner, bingo, silent auction, raffles, cake auction and 50/25/25 from 4:30 through 8:00pm! 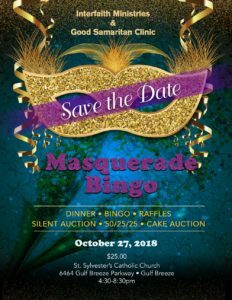 Please join us for a night of fun and fundraising at St. Sylvester’s Catholic Church in Gulf Breeze. Tickets are only $25 and will go on sale soon! Spring Into Fashion – GREAT SUCCESS! On May 11th, 2018, with the help of the wonderful volunteers of Interfaith Ministries, we were able to raise funds towards retiring the mortgage on our community’s Good Samaritan Clinic. A special thanks to all our guests who joined us in making this sold-out event such a success! We are now planning our Fifth Annual Fundraiser – Masquerade! This event will be held October 27th at Saint Sylvester Catholic Church. Stay tuned for details on tickets to this guaranteed sell-out event! We are $18,000 away from paying off the mortgage on our Good Samaritan Clinic! Thanks to all the donations we have received we are closer than ever to being able to expand our facilities and services to the community. Please share our donation video and stop by any of our locations to help out! We are hosting our 2nd annual “Spring Into Fashion” fashion show benefiting the Good Samaritan Clinic. This event will be May 11th at the Gulf Breeze Recreation Center on Shoreline Drive. The event will be held from 11:30a-2pm. Come out and enjoy lunch and fashion! Tickets are $25 and going on sale March 19th and can be purchased at Interfaith Ministries Thrift Shop or Good Samaritan Clinic. Seating is limited so act fast! Interfaith Ministries Thrift Shop will be closed December 22nd through December 26th, reopening on the 27th. We would like to wish everyone a very safe a Merry Christmas! We will be closed December 30th through January 2nd for New Years. Check out our most recent thrift shop walkthrough on our thrift shop page! 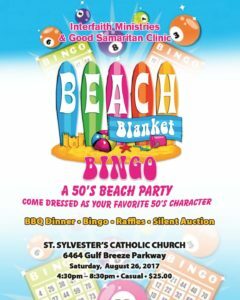 Upcoming Beach Blanket Bingo Fundraiser! We are having our Fall fundraiser “Beach Blanket Bingo” Saturday, August 26! There will be BBQ dinner, bingo, raffles, and a silent auction. Tickets go on sale soon, so be sure to pick yours up – they will sell out!